Please, for the love of everything, do not try tattoo removal at home. Public service announcement: Just because you saw it on TV doesn't mean it's going to work. 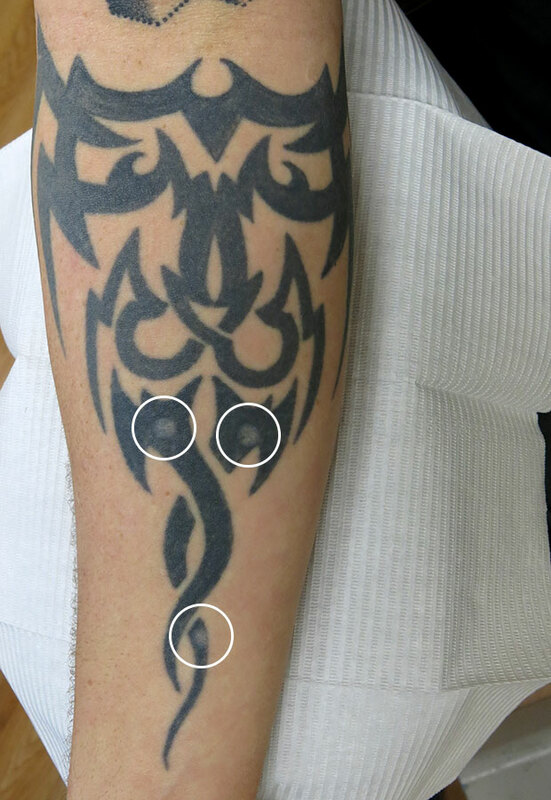 This client bought an at-home tattoo removal 'kit' after seeing it on a very popular TV show for entrepreneurs to showcase new products and get financial backing. The result was 3 small, circular marks being left in their skin, to what initially looked like cigarette burns. This has made a permanent textural change to the skin and will likely impede our ability to remove pigment from the scarred area. Wow -- I'm surprised they'd even let something that does that on the air.